University of Maryland--College Park, founded in 1856, is a public land-grant institution, and the flagship campus of the University System of Maryland. 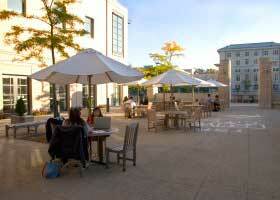 Its 1,315-acre campus is located in College Park, nine miles from downtown Washington, DC. 1,315-acre campus in College Park (population: 32,303), nine miles from downtown Washington, DC, plus 2,438-acre agricultural extension; extensive programs at the University System campus at Shady Grove in Rockville. Served by train; major airport and bus serve Washington, DC; other airport serves Baltimore (25 miles). School operates transportation around College Park, Greenbelt, and Silver Spring, and other locations. Public transportation serves campus.